Apple has released a security update for Macs running OS X 10.6 Snow Leopard. IT is a very small update under 1MB. The update addresses an important security issue with Apple Filing Protocol (AFP) and we highly recommend that you install it. For more information: About Security Update 2010-006. 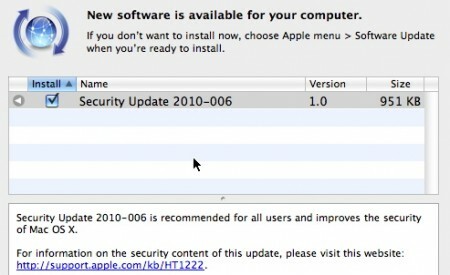 Download the update from: Security Update 2010-006 (Snow Leopard). Via: Apple Patches Snow Leopard with AFP Security Fix.